Domestication slowly transformed maize from a stubby grass into the long cobs with juicy kernels we know and love today. Nancy’s note: in 1972 I was present at an archeological site in Oaxaca, México, when a 10,000-year-old campfire was uncovered. The picture at the far left of the above photo is what is saw: only it had been thrown into the fire, blackened, and the seeds sucked out of it. It clearly looked like a grass head (maybe modern timothy?) and not the genetically-modified stuff we have today. I thought you might enjoy this article from Science . . .
(Lizzie is Science‘s Latin America correspondent, based in Mexico City). The United States is a country of corn. But 4000 years ago, the crop was an import, spreading up from Mexico and taking hold in the American Southwest. New research retraces the route the crop may have traveled and reconstructs the genetic changes it went through on the way to becoming modern maize. The findings are “a really significant advance in our knowledge and understanding of the genetics and, therefore, the evolutionary history of maize,” says Bruce Huckell, an archaeologist at the University of New Mexico, Albuquerque, who studies early agriculture in ancient Arizona and was not involved in the work. The wild ancestor of maize is teosinte, a species of grass that grows in warm, damp environments of central Mexico, where it was first domesticated sometime between 6000 and 10,000 years ago. About 4000 years ago, maize started showing up in what is now the southwestern United States. Scientists have two main ideas about how it made the trip: It might have spread up the Pacific coast of Mexico, or it might have moved first into the cooler, drier highlands of central Mexico before eventually being planted in the American Southwest. To help figure out which route maize traveled, M. Thomas Gilbert, who studies paleogenomics at the University of Copenhagen, and colleagues compared the DNA of 32 ancient corn cobs, some from Mexico and some from the U.S. Southwest. They discovered that the oldest maize samples from the southwestern United States—dating to more than 3000 years ago—are more genetically similar to maize from Mexico’s highlands than to varieties that grew along the coast, the team reports today in Nature Plants. 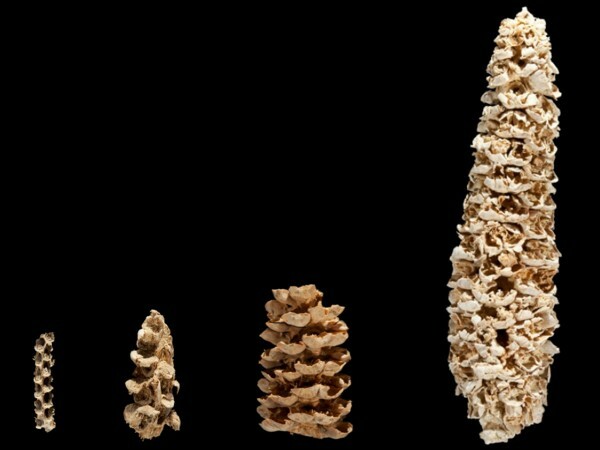 Gilbert’s team was able to reconstruct the directed evolution of modern maize. The first trait the farmers bred out of the crop was shattering, a process by which wild plants scatter their seeds in all directions—a “very, very irritating feature” if you want to collect seeds to plant the next season, Gilbert says. Then, over the course of several centuries, the farmers bred drought-tolerant maize, which allowed the plant to thrive in the dry conditions of the American Southwest. Finally, only about 1000 years ago, came improved taste, better nutritional content, and kernels that were easier to process, simplifying the preparation of foods such as tortillas and tamales. “It’s only really recently that maize has become what you would recognize as maize if you went to a grocery store,” Gilbert says.